(2) companies and individuals looking to save money and resources. Can we save money on boxes? Absolutely and Lots of It! 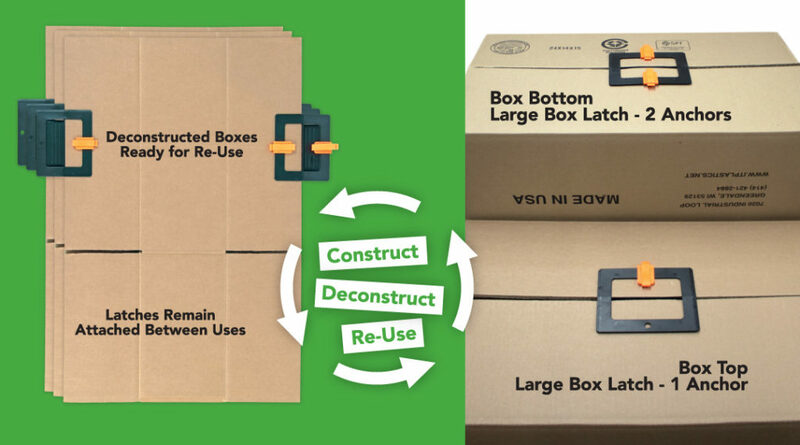 The opportunities for saving money by Re-Using boxes with our Box Latch™ Products are exceptional. Why such great savings? Just look at this graph to see for yourself. Each time your company’s closed loop box shipment system Re-Uses its boxes, the financial return on investment (ROI) rises. 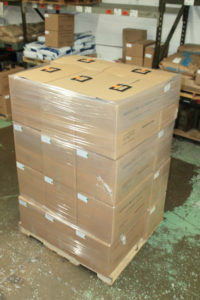 When you contact us, a members of our sales team will use our Excel calculator to enter your a) number of boxes used in your business or home, b) unit cost of those boxes by size, c) estimated number of Re-Uses per box with our Box Latch™ Closure Products (BLCP) and d) unit price of the best Box Latch™ Product to determine your savings and ROI. Add to this the environmental ROI that comes with Re-Use instead of recycling, and your company’s Chief Sustainability Officer (CSO) will love you! Are There Even More Savings to Be Had? Yes Again! The use of our highly Re-Usable Box Latches™ a) reduces or eliminates the cost of tape, b) reduces costs for disposing of the boxes, c) eliminates human injuries from the use of knives or box cutters to open the boxes and d) does away with damage to the contents inside the box. What is the Sustainability and the Environmental Impact of Box Latch™ and Box Re-Use? The buzzword for the second decade in the new Millennium, and what many companies and industries are touting in their marketing efforts, is sustainability. What makes our Box Latch™ Products so environmentally responsible? Research has shown that 90% of corrugated boxes are used once and 30% are not recycled at all. Instead, they end up in landfills. Products that encourage box Re-Use definitely are a part of the responsible business movement. • Our Box Latches™ are Re-Usable and recyclable as a #7 plastic. • Our black units are manufactured from recycled ABS plastic. That source doesn’t work for our colored units because it is impossible to produce consistent colors due to the color variations in recycled plastics. • They are easy to use and extend the lives of boxes before recycling or disposal in landfills. • Their use eliminates the upfront costs of tape, glue, staples and the unneeded disposal of these elements in the environment. What’s The Story on Multiple Uses? Are Box Latches™ With or Without Anchors Difficult to Use? No, applying them on boxes is so easy a child can do it. 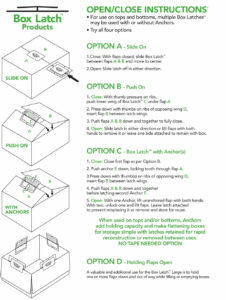 Take a look at the graphic to see the different ways to attach to boxes. What Is It About These Made in the USA, Patented and Patent-Pending Products That Make Them Work So Well? They are simple, yet extremely durable, malleable, and functional design is based on five+ years of research and development. They are at the forefront of the Re-Use Generation of products. What is the Holding Capacity of the Box Latches™? 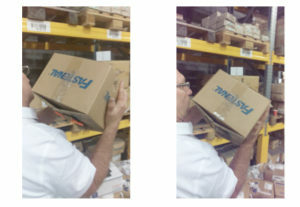 The following photos illustrate that during a July 2016 trade mission to Europe, our Box Latches™ with and without Anchors, were capable of holding a 40 pound box of nuts and bolts closed when turned upside down, much to the amazement of the Fastenal Europe product distribution manager in Dordrecht, Netherlands. Can We Close Box Tops and Bottoms with Box Latches™? Yes! Box Latch™ Products can be used on the tops and bottoms of boxes. When used with our patent pending Box Latch™ Anchors, these latches provide remarkably effective holding power for all types of contents. Whether or not you want to flatten your boxes after each use will dictate your use of them. If the answer is Yes, implement them on tops and/or bottoms using Box Latches™ Large, Medium or Small with one or two Anchors as you simply mix and match for desired holding capacity. If the answer is No, we are not breaking down our boxes to store and Re-Use them, it makes the most sense to use them only on the tops of boxes. Warehouse and Inventory Management Opportunities? Our latches provide exceptional value wherever boxes need to be opened and closed frequently to insert or remove contents during storage. Various colors can be used to correspond with sections within a storage facility. Box longevity can be increased when labels are placed on the latches, instead of on the boxes. Can Boxes Closed With Our Products Be Stacked? Yes. However, stacking of Box Latch™-closed boxes will not work in all transportation and/or storage systems. This means you will have to test the waters in yours. Does the Thickness Of the Corrugate Matter? To a certain extent, Yes. Click here for a chart of corrugate types and thicknesses. Our first product, the Box Latch™ Medium is used most commonly for small to medium sized boxes made of 1/16 inch (6 mm) to 3/16 inch (18 mm) thick cardboard. The Box Latch™ Large will close medium to large sized boxes made from 1/16 inch (6 mm) to 5/16 inch (30mm) thick cardboard. Can Boxes Closed with Contents to Be Shipped by USPS Priority Mail, UPS, FedEx DHL or Other Carriers? Yes. To date, we have not found any person within the USPS or UPS systems who could or would verify or authorize the shipment of boxes using Box Latches™. Each of these shippers said, “Just give them a try.” Thus, various people have shipped individual packages using each of these shippers without any challenges. In the event security is essential, we have access to resources where people can purchase tamper evident tape to be placed over the latching devices. Zip ties also can be used. However, using our latches for individual packaging only makes sense if you can get the boxes back so you can Re-Use them and the latches. This is of particular value with Styrofoam insert boxes used in the medical field and the perishable goods arena where the boxes are sufficiently expensive to include return shipment labels to have their boxes returned empty. Who, When, Where and How Can Your Box Latch™ Products Be Used? With a) WIP (Work in Process or Work in Progress) systems and b) storage of inventory or parts and components c) where boxes must be kept closed to prevent damage to contents by foreign matter, dust, microorganisms or light. When transferring boxes from manufacturing to fulfillment or distribution centers for intrastate, interstate, between countries, and even for intercontinental shipments where the boxes may be returned full or empty for Re-Use. • To reopen boxes in a “partial box, content pick” systems. • To eliminate the need for tape on boxes that all too often gets caught on conveyor rollers and photo cells, shutting down the entire line. • Repeated taping destroys these expensive boxes while Box Latches™ allow for the identification to be placed on the plastic Box Latch™, where it remains, and not on the box. Click here to learn more. • Re-Use of boxes for humanitarian missions requiring rapid packing and unpacking of medical and food supplies will speed delivery of these aid items and prevent thousands of tons of cardboard from being discarded in already troubled zones. • Re-Using the cardboard multiple times for these missions with environmentally sustainable methods magnifies the mission’s impact and can double or triple mission efficiency and effectiveness. • When left behind in locations with limited packing and storage capacity, these boxes and their Made in the USA latches can be Re-Used by local residents, thus, improving the military’s and government’s image and commitment to a sustainable future. • Storing flattened boxes with Box Latches™ attached allows for rapid deployment of mobile storage options without having to purchase or store millions of dollars of packing tape, tape guns, or box cutters, increasing overall government and military mission readiness. • Packing and shipping of government and military assets between supply depots and installations in sealed pallets and containers allows the Re-Use of boxes without having to track down packaging materials. • Storage of infrequently used semiannual or annual assets, such as seasonal and ceremonial gear and preventative maintenance system equipment and materials. • They look cool and, when used with the Anchors, automatically translate to Go Navy! • Applying the label of the military or government agency on the Box Latch™ serves as a recruitment device, demonstrating the agency’s commitment to sustainability in a way that attracts today’s environmentally conscious youth and casts a favorable public image. • To prove the government is being responsible and supporting local businesses with a “Made in..” the invented and manufactured product as it joins the box Re-Use revolution. • For companies that pack, transport or store and unpack their customer’s items. 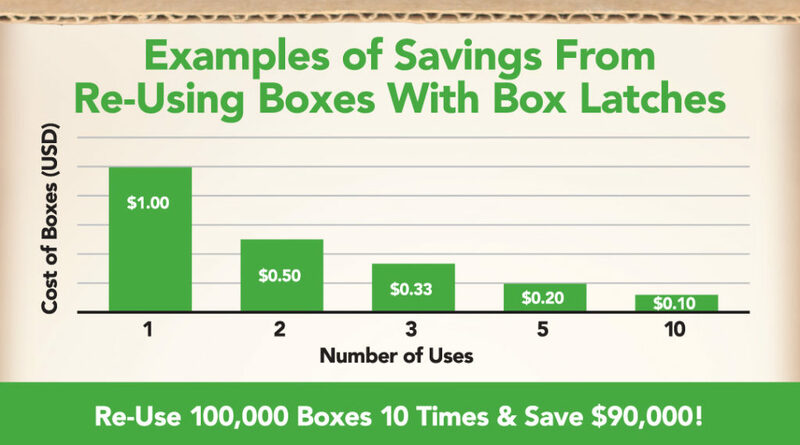 • Reduces cost of tape and the box destruction it causes and promotes potential re-use of boxes, leading to major financial and environmental savings. • Tamper evident seals are available if needed. • When expensive, large boxes can be broken down easily with their Anchored latches in place and returned for re-use in a closed loop. • Where boxes with full or partial contents are stored on top of or under display shelves or on racks in storage areas. • When seasonal items are re-boxed and stored for the next season. For those that would like to close boxes with promotionally labeled Box Latches™ to enhance their sustainability mission as they promote their business and customer loyalty (wine, antique, boutique). • When access to display materials is needed at the opening and closing of each show or on a moment’s notice. Where boxes are opened, closed and re-used as delivery route destinations are stocked. • To flatten boxes between uses, conserve storage space for them, and go green! What Are Dimensions of and How Do These Box Latch Products Weigh? Our first injection molded Box Latch™ is now the Medium. To strengthen its holding power and add options to its use, we enlarged it and added holes that can be used to store the large ones on pegs and insert one or two Anchors to enhance its strength even more. While working with the Toyota Parts Centre in Diest, Belgium, they asked us to develop a one-piece, anchored product. 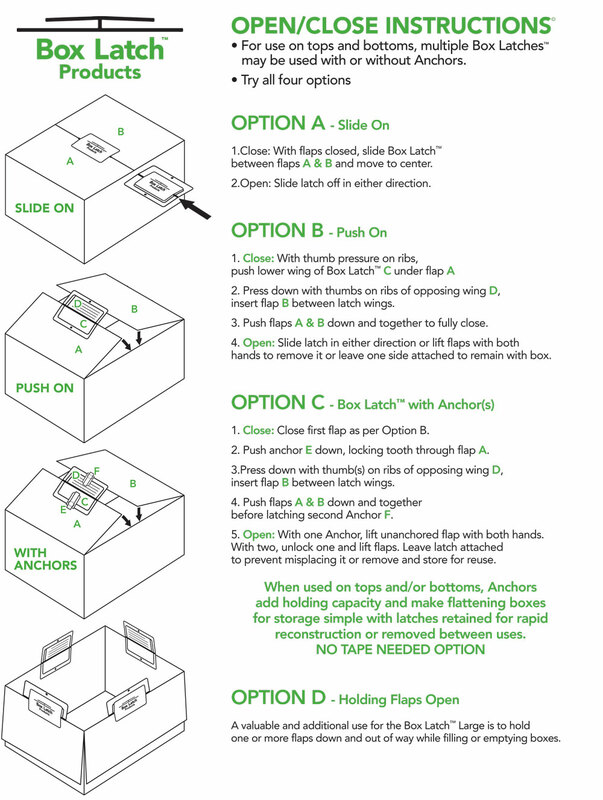 That led to the extremely lightweight Box Latch™ Small that can be produced with no, one, or two Anchors. Their sizes and weights follow. How Much Weight Can Be Placed In Boxes Closed with Box Latch™ Products? • Due to the extreme variation of box sizes, shapes and contents, we do not have specific guidelines. That said, we have multiple Box Latch™ products that may be used by themselves or in combination for nearly every situation. • Please contact us info@www.boxlatch.com or call 920.541.3404 to describe your box sizes, wall thickness, and quality as well as the items you will be placing in them. We will be happy to send samples for you to test before you purchase. All we ask of you is that you cover the shipping charges. • Our Box Latch™ Large with 2 Anchors will have the most holding capacity. Occasionally, two of these will be needed on box bottoms when very large boxes and/or heavy contents are employed. Yes! For orders of more than 1,000 or to use a company purchase order (PO), please contact us by email info@boxlatch.com or call 920.541.3404. Can Box Latches™ Be Promotionally Labeled? Yes. Please email info@boxlatch.com or call 920-541-3404 to learn more about this unique marketing opportunity or to place an order. 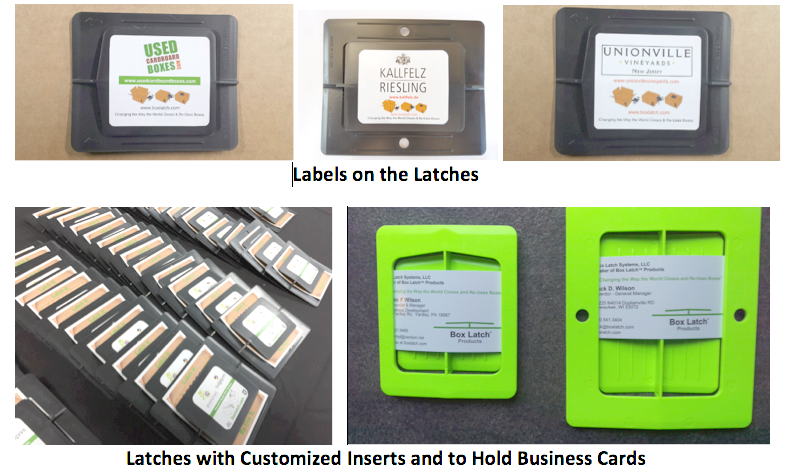 You can request non-labeled Box Latch™ Medium or Large sizes and have your own label made or ask us to create your label for you. When appropriate, we can supply the electronic file we use for promo labels so that you can drop your logo or marketing message in it. Can Other Labels Be Applied to Box Latches™? Yes. Command Codes such as a) Hold For Inspection, b) First of Lot, c) Last of Lot, d) Partially Filled, e) Hold for Inspection, f) Passed Inspection, as well as g) RFID labels and h) adhesive colored dots for easy identification all may be applied. The placement of customized product identification or bar codes on the Box Latch™, rather than on the box, allows for constant Re-Use of unlabeled boxes. This allows them to be used for other purposes, eliminates labeling costs, avoids defacing them and eliminates confusion during future use. Do Box Latches™ Come In Multiple Colors? Yes. Currently, the Box Latch™ Medium and Large that originate from recycled material are produced only in black. Our neon green, blue, and red ones all are slightly more expensive because they must me made from virgin material. If you would like a custom color for 10,000 or more, please Contact a Sales Representative. Our experience has been that black works best for most promotionally labeled latches. Are The Box Latched Durable? Yes. While demonstrating our products for Toyota in Belgium and Fastenal in Netherlands, we ran over the Medium and Large Box Latches™ with our rental vehicle and then illustrated that they did not break. In fact, it increased their holding power. After four years of production, we have only ever had one latch returned. It had been run over by a forklift but still worked fine! We hope you have found these FAQs helpful. Please contact us at info@boxlatch.com or call us at 920-540-3404 if you don’t find the answers to your questions on our website and you need further assistance.